Last weekend saw the return of the family festival Into The Trees. Into The Trees is like the little sister of Elderflower Fields. It has many of the woodland activities, but without the live music. Like Elderflower Fields, it’s set in the magical Pippingford Park. This is part of the ancient Ashdown Forest in Sussex, UK. If you’ve read this blog for a while, you’ll know the importance of connecting with nature. Spending time in woods not only improves your emotional state and immune system, but it also heightens our awareness. This is because our vision adjusts to distinguishing small movements and details in the distance. Into The Trees is a family festival where the focus is on enjoying fun activities in nature. The organisers, outdoors education and events specialists So Sussex, put on a range of activities for children. These ranged from a giant zip line across water, rope swings, axe throwing, mountain boarding and slack lining. Those wanting calmer activities could enjoy foraging walks in the woods and bushcraft workshops. Sussex Wildlife Trust were on hand to tell people about Pippingford Park and ways to get involved with your local woodland. Younger children headed for the mud kitchen, and made whistles and dream catchers in the woods. The storytellers included one my favourites, Andreas Kornevall, inspiring audiences with mythical tales from around the world. My family always head straight for The Woodland Tribe whenever they make an appearance. They come armed with planks, nails, hammers and saws, and let kids build their own adventure playground (under supervision). 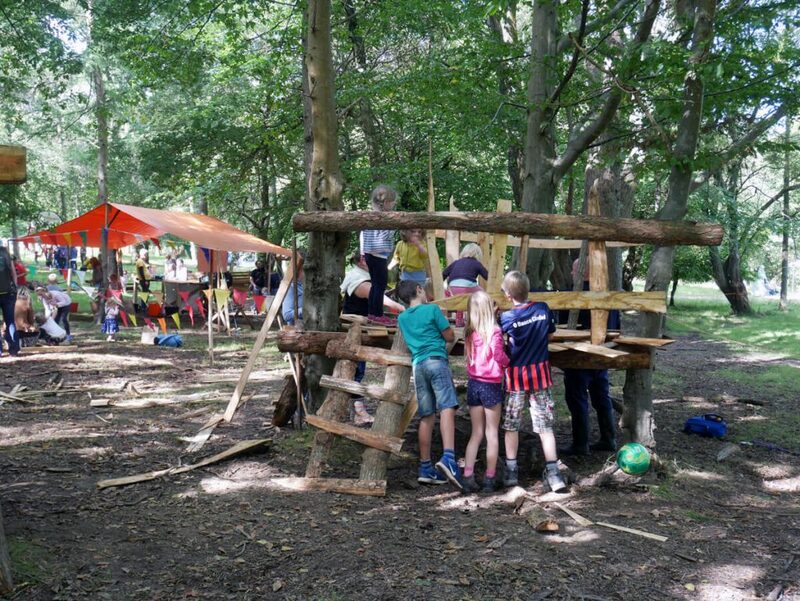 Woodland Tribe’s adventure playground, designed and built by the kids. Mythical tales from around the world by Swedish storyteller Andreas Kornevall. Axe throwing and cross bow practise. Mud kitchen for the little ones. Make your own dream catcher in the woods, using feathers, string, bendy willow twigs and more. 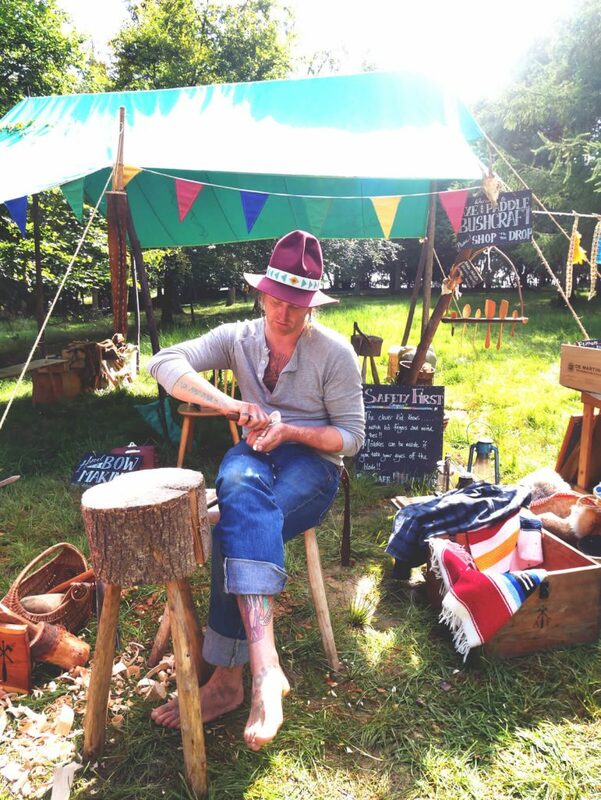 Bushcraft demonstrations, carving wooden spoons, knives and more. This family festival is remarkably well priced at £22 for a family ticket. There’s a small extra cost for some activities. Into the Trees returns to Pippingford Park 9-10th September 2018. In the meantime, I look forward to Elderflower Fields 25-28th May at the same location. If you enjoy a family festival, also have a look at this post about July’s DIYestival – I was part of organising this event. The post includes some great smoothie recipes, including a refreshing hangover smoothie! A walk through the peaceful wood where Into The Trees took place.